Lawn irrigation systems that have an elevation change of more than two or three feet are subject to low-head drainage. Water in the lines flows to the lowest point unless stopped, which means that the sprinkler at the low point in the zone will dribble after the valve closes. This causes puddling around the sprinkler, wastes water and introduces air into the lines, which is hard on the sprinklers when they next open. You can quickly confirm that the problem is low-head drainage by observing the other sprinklers in the zone. If they're leaking, too, it is a valve problem. If only the low head is seeping, an anti-drain check valve will solve the problem. There are two solutions. Turn the retaining collar at the top of the sprinkler counterclockwise until the collar and sprinkler mechanism are free from the housing. Remove the sprinkler mechanism. Remove the filter screen located at the bottom of the sprinkler mechanism. A dental pick is an ideal tool for this job. Needle-nose pliers will work, too. The screen is press-fit, there are no threads. Do not try to unscrew it, just pull it out. Press the filter screen with check valve into place and reinstall the sprinkler into the housing. Dig around the sprinkler carefully, using a shovel, until the housing and the connection between the sprinkler and the pipe are exposed. Turn the housing counterclockwise until it is free from the threaded fitting at the base. The threaded fitting is on a riser or flexible joint that connects to the main pipe. The riser or flexible joint must be modified to allow for the height of the inline check valve. This is situation-specific and will require evaluation of the materials used and the options available. Thread the inline check valve onto the threaded fitting. Thread the sprinkler housing onto the inline check valve. Backfill around the sprinkler. Tamp, level and replace the sod. Option 1 is the best choice if your model sprinkler has an optional internal check valve available. The two most widely distributed sprinklers on the market (the Rain Bird 5000 and the Hunter PGP) have this optional available. Other models may not. Check with your irrigation supplier. If your model of sprinkler does not have the option to add an internal check valve, the inline check valve option will work. Because of the height increase from the check valve, and the price of the check valve itself, it may be easier and more economical to replace the entire sprinkler with one that has an internal check valve. 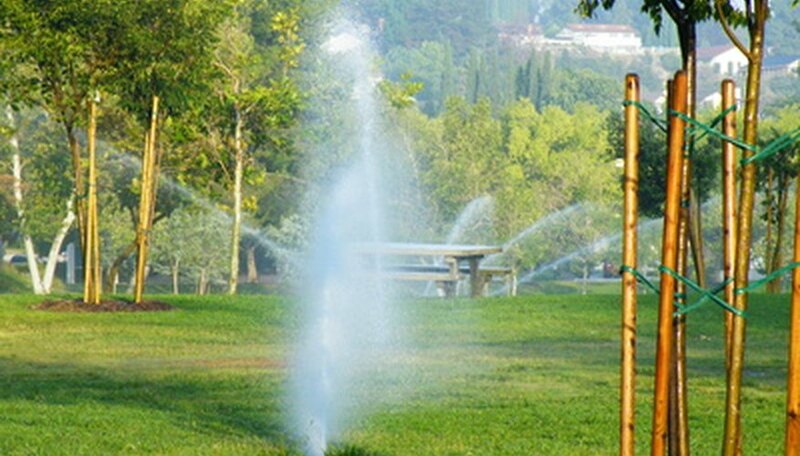 Check valves became mandatory on irrigation systems in California in 2010. Other states with tight water supply and growing demand will likely follow. IrrigationTutorials.com: What is Low Head Drainage? Jeff Farris has focused on instructional communication since 1980. His work includes instruction manuals, promotional materials, video scripts and web content on a variety of hands-on topics. His work has been published in "Scuba Diving" magazine as well as several websites. He holds a Bachelor's degree in marketing from the University of Missouri. What Are the Causes of an MF Tractor Overheating?